Moderate stance on the role of capitalism in Chilean society and economy is needed, instead of market fundamentalism or anti-capitalist discourse, warns Finance Minister who steered Chile through global crisis. With the Chilean presidential and parliamentary elections coming up this weekend, voters will choose who they feel best responds to the pressing social demands that have dominated the country’s political debate since the eruption of massive student-led protests in May 2011. The range of candidates on offer, particularly those to the left of the traditional political centre who are proposing reforms even more radical than those of front-runner and near-dead-certain winner, former President Michelle Bachelet, goes some way towards explaining the complexity and range of these social demands. Meanwhile the very fact that the majority of these candidates, including Bachelet, have posited themselves firmly in the centre-left to radical-left part of the political spectrum suggests that huge swathes of Chilean society have finally had enough of the strongly free-market, beefed-up capitalism that has defined the country’s political, economic and social landscape for decades, bringing it undoubted economic gains but at the cost of leaving Chile one of the most unequal and socially stratified countries in the world. It is in this context that the former Minister of Finance during Bachelet’s first term (2006-2010), Andrés Velasco, has spoken about the need to try and build a more “responsible capitalism”, asserting that capitalism has “abused” Chile and that “that is what leads to dissatisfaction, resentment, and anger towards capitalism”. Speaking at a forum titled “Responsible Capitalism”, organised by Chilean business newsgroup Diario Financiero, Velasco insisted that he didn’t want to say that market-based capitalism in itself was bad, but rather that it required good governance to steer it in the right direction so as to be an asset to society as a whole. “Public policy that thinks that the market is always good, is bad policy, whereas policy that thinks that the market is always bad is also a negative approach”, Velasco told his audience, adding that “good public policies are those which understand that the market has its virtues, but that these don’t just drop out of the sky, they have to be encouraged”. He also suggested that the negative view of market-based capitalism held by various sectors of society has come about because of the involuntary nature of some of the “transactions” carried out within a market system. According to Velasco, this is what has brought the “dissatisfaction, resentment, and anger” that has been so visible in the frequency, size, and impact of the social movements and protests that have taken hold over the past two and a half years, as well as in the general shunning of the country’s political class. Even though Bachelet herself is still considerably popular, having left office in 2010 with approval ratings around the 80% mark, her coalition is viewed favourably by barely a quarter of the population, according to polls. Furthermore, the centre-right government of Sebastián Piñera has seen its popularity plunge to historic lows for most of its time in power, something that is seen as being a major factor in its presidential candidate, Evelyn Matthei, having such little support among the electorate as the country heads to the polls (opinion polls show her voting intention as peaking at around 20%, while many show it in the mid-teens). “Capitalism has abused”, Velasco continued, “and that is a discussion that is being held in Chile as well as in the rest of the world, and what all these countries have in common is that contracts granted to companies, and the conduct of these companies, have been perceived as abusive”. As Minister of Finance under Bachelet, Velasco was responsible for steering Chile through the Global Financial Crisis, which ravaged economies worldwide during much of 2008 and 2009. Chile, like most other South American countries, has an economy that is highly dependent on the export of primary and natural resources, with destinations usually the consumer countries of the West and emerging economies such as China and India. In Chile’s case, the key export is copper: Chile produces about a third of the world’s copper, providing the country with a significant chunk of its export earnings and government revenue. In 2012, copper mining made up 12% of Chile’s total GDP, and contributed almost a fifth of tax revenue. However, when the financial crisis struck, prices of primary resources and raw materials fell drastically, along with demand. This had a severe impact on the economies of Chile and other Latin American countries. Fortunately, several years beforehand Bachelet’s government had set up a Fondo de Estabilización Económica y Social (FEES – Economic and Social Stabilisation Fund), which took windfall profits from the copper mining industry and set them aside as a sort of insurance fund against economic downturn. By the middle of 2008, this fund had amassed over US$18bn, around 8% of total GDP. At the start of 2009 Velasco announced that the government would release some US$9bn to help fund a government stimulus package that would reignite the country’s economy and power it through the worst of the global downturn. The policy is almost universally acknowledged to have been a success, as Chile returned to growth that was even stronger than it had been immediately prior to 2008. Velasco, who had come under fierce criticism from disgruntled supporters of the centre-left Concertación government for not having previously used the fund to finance much-needed social reforms, was suddenly one of the most popular members of Bachelet’s cabinet, as voters, international observers and global financial institutions saw the wisdom of this counter-cyclical policy that helped prevent the kind of social impacts seen in past crises in Chile and Latin America, or indeed in Europe during the current downturn. 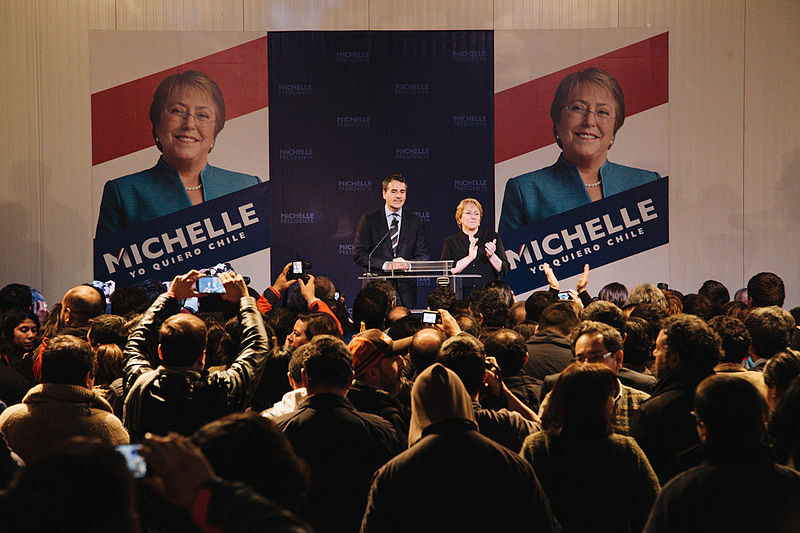 The return of Bachelet and the centre-left: taming capitalism in Chile? Bachelet promises a raft of reforms if elected, including a new more progressive constitution to replace the one written under the military rule of General Augusto Pinochet in 1980; education reform including free university tuition and an end to profit-making ideals in education institutions; and a tax reform to distribute income more fairly as well as finance the education reform, seen as the most pressing demand of the Chilean protesters. However, some on the left and centre-left have criticised Bachelet’s government programme for being too ambiguous and not progressive enough. Marco Enríquez-Ominami, a former member of Bachelet’s Socialist Party who quit in 2009 to run as an independent candidate for the presidency, racking up 20% of the vote, and who is standing again this year (although opinion polls suggest he will come 4th and with much less of the vote than 4 years ago), insisted after Bachelet’s manifesto was released that “I am from the progressive side of things, not the conservative left”, saying that the former president’s proposals were a “step backwards”. Meanwhile, Alfredo Sfeir, candidate for the Partido Ecologista Verde (PEV – Green Ecologist Party), said that the programme put forward by Bachelet and the New Majority “implicitly embraces the neoliberal system”. Nowadays, Velasco and Bachelet have grown somewhat more distant, and Velasco stood as a presidential pre-candidate in June’s primaries for the centre-left coalition, now called Nueva Mayoría (New Majority), a contest which Bachelet won convincingly. However, it is possible that he will have a role to play in the likely event that Bachelet and the New Majority come to power in the new year, and so his vision of a “responsible capitalism”, backed by his innovative FEES policy while in charge of the economy, may prove indispensable to a coalition led by Bachelet that is striving to show its supporters that it can make capitalism work for the majority of Chileans, which as the widespread protests of the past couple of years have apparently demonstrated has not been the case over the last few decades.